Mathematical Structures in Computer Science is a journal of theoretical computer science which focuses on the application of ideas from the structural side of mathematics and mathematical logic to computer science. 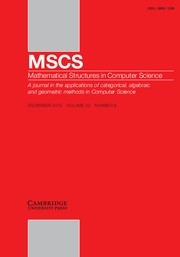 The journal aims to bridge the gap between theoretical contributions and software design, publishing original papers of a high standard and broad surveys with original perspectives in all areas of computing, provided that ideas or results from logic, algebra, geometry, category theory or other areas of logic and mathematics form a basis for the work. The journal welcomes applications to computing based on the use of specific mathematical structures (e.g. topological and order-theoretic structures) as well as on proof-theoretic notions or results. The journal will also accept contributions in new interdisciplinary fields bridging computer science, quantum physics, mathematics and information theory. In particular, papers on quantum information processing and communication, as well as on the related issues in quantum language design will be considered. The journal is also interested in papers on computational modelling of epigenetics phenomena, protein-protein interaction, stochasticity in molecular cascades. Mathematical approches to System Biology will be welcomed, within the broad frame of post-genomic views of embryogenesis and evolution.